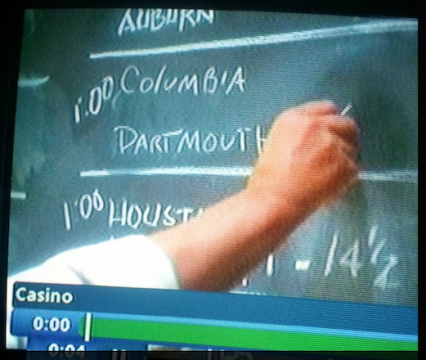 Silver screen badasses apparently love to bet on Auburn. Bruce Willis. Sinatra. And, look at that, De Niro. That’s his hand getting ready to handicap the Auburn-_____ game in Casino. For his sake, we hope he liked Auburn. Going on the research of the eagle-eyed Carson Montgomery, and factoring in Martin Scorsese’s reputation for historical accuracy, we’re actually thinking this might be a 1972 match up, and The Amazins never had much use for the odds. Related: Frank Sinatra doesn’t care that Auburn beat Alabama by 12 points. Nice catch! This is no B-rate film. One of my favorites. Can’t believe I never noticed this before.